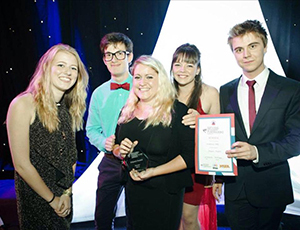 Middlesex University Raise and Give (RAG) has won a national award for making a huge difference to the local community. The group won the Impact Award at this year's National Student Fundraising Awards (NaSFA), in recognition of the way it has transformed a London soup kitchen. Middlesex RAG got involved with Muswell Hill soup kitchen at the beginning of 2014. Students started visiting the kitchen to help the overstretched staff meet the needs of the local community; and they now visit several times a week, whenever extra help is needed. On a day-to-day basis, the volunteers (called 'soupies') prepare the food, stock the pantry, setting up tables, set up the space for clothing donations, mop the floors and serve visitors. They have also helped improve the way the kitchen works overall - reorganising the pantry, holding food bank collections on campus, and even setting up an allotment on campus, to grow vegetables which can then be donated to the project. Sophie Bragg, current President of Middlesex RAG and BA Dance student, said: "RAG has worked very hard in the past year, exploring some new challenges, getting involved with new charities and setting up the soup kitchen. "I'm so proud of what we've achieved, and am also excited for the new year and what we have in store!" So far, 63 Middlesex students have helped out at the soup kitchen and / or the allotment - putting in a total of 567 hours' work and serving between 40 and 60 guests per night. Sophie McKay, Vice President Health & Education, Science & Technology at Middlesex Students' Union, explained why the award means so much: "I helped set up RAG at Middlesex just three years ago - it's amazing to see how the group has already developed, and the award is the icing on the cake. 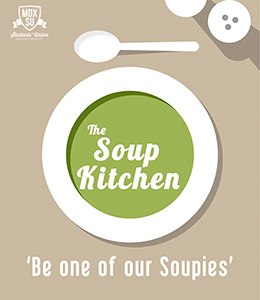 "We're particularly proud because the soup kitchen project is all about getting involved directly with the local community, not just setting a fundraising target and achieving it. We're looking forward to staying involved in the coming year!